I had the unfortunate experience of receiving a 21 month federal prison sentence for my involvement in a mortgage fraud conspiracy that took place over 20 years ago. One of the positive things that came out of that journey was this research. I took notes while I was in prison and have come up with what I believe to be a pretty accurate profile of a would-be inmate. To those of you who are mothers and fathers, this might explain a lot! This one can easily be avoided. There are literally tens of thousands of other names to choose from. All you have to do is pick one of these other names. Caution: think twice about choosing a girl’s name. If you’ve already named your daughter Bubba – why? Sorry to say folks but its true. Prisons are full of hairy backed men. I don’t know if children with hairy backs grow up full of anger from the years of ridicule, and then work through the resentment by stealing stuff? I’m just not sure. But you’d swear the Federal Bureau of Prisons has rounded up all of the “missing links” and locked them up. If your boy enjoys communicating at between -110 and -120 decibels during normal conversation, beware. Look on the bright side – he’ll get to kick it up a few notches once the cell slams shut. They like LOUD there. We’re not just looking for a light rumbling snore. Here’s a little test: Stack two 24 oz. slabs of raw prime rib (minimum of 2 inches thick) – one on top of the other. Take them to the car wash and pull up to the car vacuum area. Insert that big heavy vacuume hose halfway in between the two cuts of meat. Then, turn it on. The loud, percussive flapping sound that will be created as the air is sucked through the meat sounds exactly like that of an inmate snoring. Compare this with the timbre of your son’s snoring. Check! I’m not saying that your kid is doomed if he gets Ds or even Fs. I’m talking about the complete and utter moron child. I’m talking about the stumped-for-an-answer-when-you-say-hello type of idiot. I know that this sounds harsh, but if you think your son might actually be a STUPID idiot – just get it over with and call the cops. Tough love people. Will My Kid Go to Prison? I’m not suggesting that we pre-judge our children – well, maybe I am. But I took advantage of a unique opportunity to conduct this research and now I’m sharing it with you. I’ll ask again: Can you say, my son federal prison in the same sentence? For me, only one of the above held true – I think. 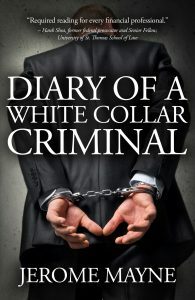 Jerome Mayne is the author of the book, Diary of a White Collar Criminal and co-author of Mortgage Fraud and Predatory Lending – what every agent should know (Dearborn/Kaplan). He is a keynote speaker and has worked with dozens of companies and associations helping their people make the right decisions, when the right decisions aren’t easy.